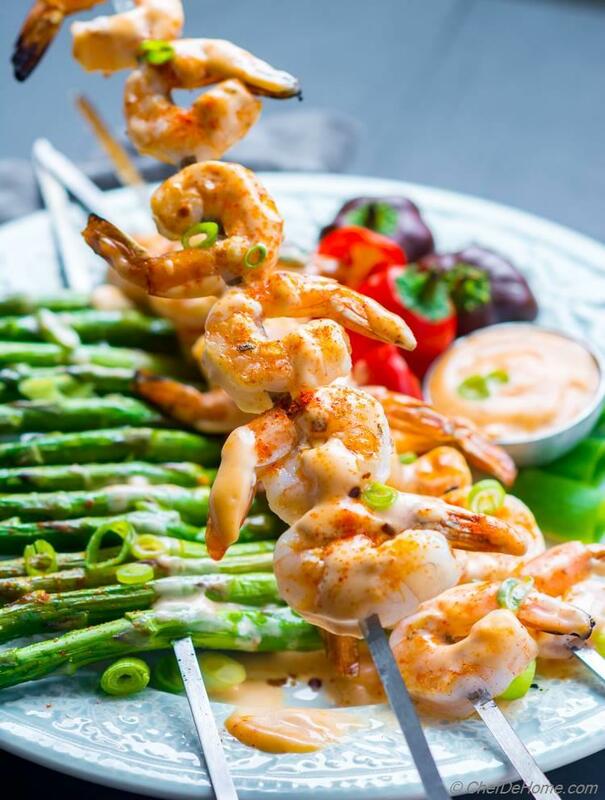 Lightened-up Grilled Shrimp Skewers for summer dinner with delicious Bang Bang Sauce. Bang Bang Shrimp Skewers recipe is my lite and delicious take on classic Bang Bang Fried Shrimp with better-than-original Bang Bang Sauce. Sweet, spicy and creamy sauce makes shrimp (kabobs) amazingly flavorful, almost addictive. You can't stop at one serving, for sure! 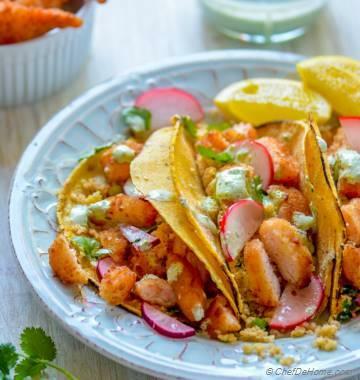 If you are fan of Bang Bang Shrimp, this lite version is must try at home! *Gluten free, carb-free, and low-fat. Oh, and no worries if you not looking to grill for weeknights! You can even saute shrimp in skillet. Just don't forget to prepare the Bang Bang Sauce. Sauce is the heart of this recipe. 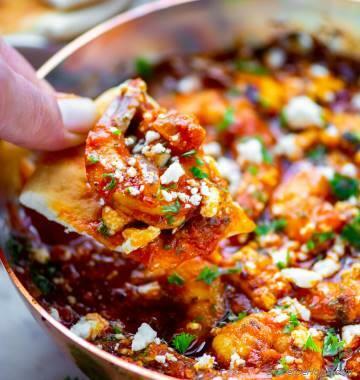 Do this and serve restaurant-style, lightened up, sweet and spicy shrimp dinner.. so much easier to prepare at home than you might imagine. 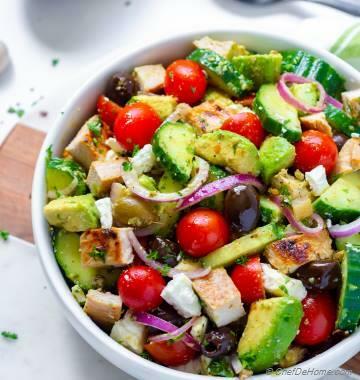 Serve with grilled veggies for seafood-inspired summer grilled dinner. So, let's cook some baNG-baNG Shrimp! Shall we? Bang Bang Shrimp is one of my favorite appetizer. Original dish has fried popcorn-style shrimp smothered in bang bang sauce. It has crunch, sweet and spicy flavor - really all you desire from an appetizer. Being foodie, when I love a restaurant classic, I get obsessed to try cooking at home. Few reasons; 1) to save some $$ 2) to get chance to eat it whenever I want. 3) often to make it lite and delicious. Grilled Shrimp Skewers are one of our favorite summer dinner. 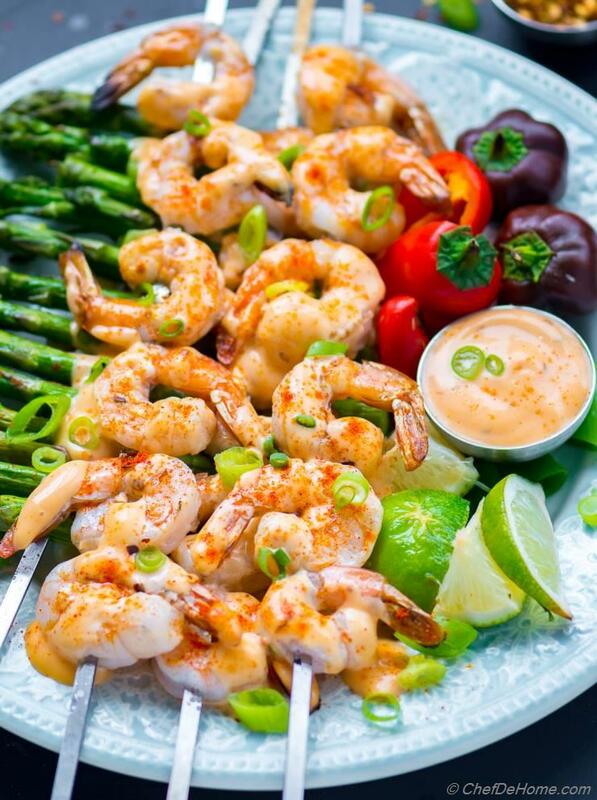 Even though I don't mind a big bowl of classic bang bang shrimp for appetizer but with this recipe I decided to combine two of my favorites - grilled shrimp skewers and bang bang shrimp appetizer into one delicious and lite summer meal. I kept bang bang sauce just as addictive and delicious as original and lightened up shrimp by grilling it instead of deep frying. Bang Bang sauce may sound intimidating but really you can make this sauce in minutes. It needs easy-to-find pantry ingredients and a whisk to mix'em. Easy! Right? Resulting sauce is thick, creamy, spicy, sweet and tangy. No one can guess it is magic of some sriracha, mayo, honey and lemon. Sauce is so good I even serve it as dip for other finger foods. Specially, seasoned Potato Wedges and this sauce. OMG! yumm! You know the best part? It is such a dinner favorite that fly from kitchen to dinner table in 15 minutes. 1) Prepare the Bang Bang Sauce on weekend and refrigerate. It stays good up-to 1 week. 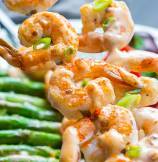 2) When ready to serve dinner, skew shrimp on skewers, season, and grill. Or saute in skillet. I include veggies for more substantial and healthy portion. 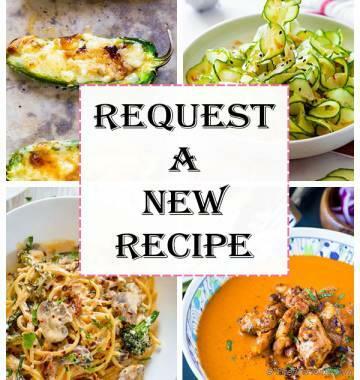 I used Grilled Asparagus and Sweet Peppers for this recipe. 3) Drizzle sauce on top, serve and enjoy! Getting to eat restaurant favorite at home is pure bonus! 2. 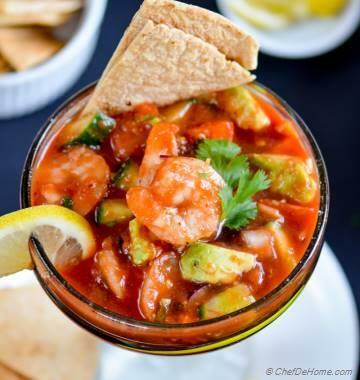 In a wide bowl, add shrimp with lime juice, minced garlic, few pinches of salt, 2 tbsp oil, and black pepper. Toss of coat shrimp. Leave aside for 5-10 minutes (no longer as shrimp starts to cook in acid). 3. Bang Bang Sauce: In a bowl, add sriracha, sambal chili paste, honey, mayo (or vegenaise). Whisk well to make sauce. Taste and adjust salt. Set aside. 4. Skew shrimp onto 4 metal skewers. I skew 6 pieces per skewer. You can also *add veggies per skewer to make healthier portion size. 5. Grill on pre-heated grill 2-3 minutes per side. 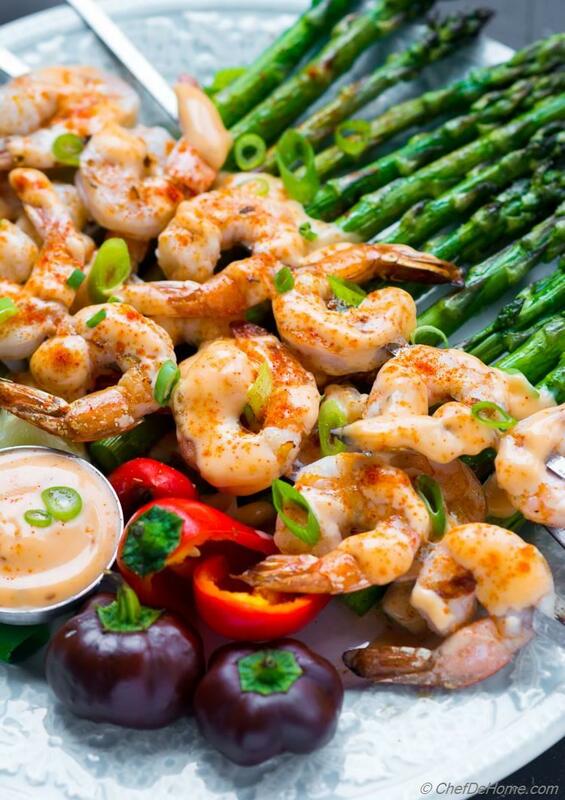 Don't wait for grill marks as shrimp should not be overcooked. As it turns pink from all sides, it is done. 6. 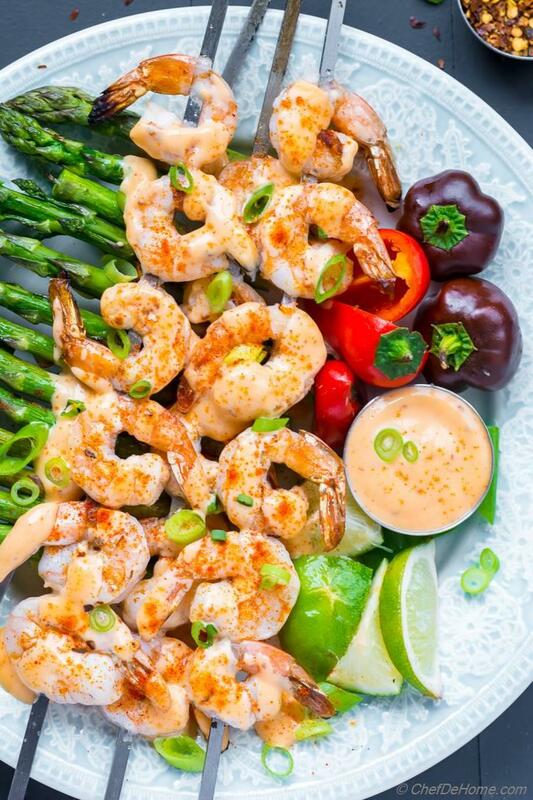 Drizzle shrimp with bang-bang sauce. Garnish with scallions. Serve lime wedges and more sauce on the side. Serve and enjoy! I grilled asparagus and sweet peppers along with shrimp. Bang Bang Sauce also tastes great on grilled asparagus.